The Callaghan Country team is a small and eclectic crew of mountain loving individuals. Understanding that we are in the business of happiness, our service comes with the unique personality and charm that makes a place memorable. All team members tend to wear multiple hats to pull off a successful winter season at Callaghan Country and you are likely to find us either smiling out of a deep gratitude for our mountain surroundings and the amazing work family we are a part of, or grimacing because, well, sometimes it's really hard work and we're putting our ALL into it. Bottom-line, we all care about what we do and hope it shows. 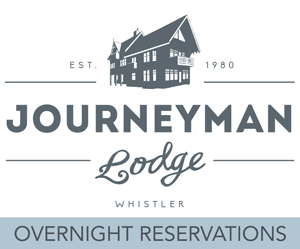 ​This is ​Joseph's second season at Journeyman Lodge. If he's not in the kitchen, it's pretty much a guarantee that he's out shredding pow. Originally from Ottawa, Ontario, Joseph comes to us with a classic case of an 'Easterner's love for the West Coast'. As a crew member at Callaghan Country, he's living the dream as our head chef at Journeyman Lodge, playing in the mountains by day and delighting guest palates by night. Joseph learned by osmosis the pleasures of hosting and cooking for large groups of family and friends from his Mom and Gramma. He would later move to Vancouver, British Colombia to become trained in French Classic Cuisine at the super hands-on, experienced based programs of VCC in Vancouver. Also here for their second season at Journeyman Lodge are Hosts, Fabien & Valérie. These two are a couple full of adventure & passion for the outdoors. With interests ranging from horseback riding and fishing to trekking and astronomy, their enthusiasm for unique outdoor adventures can be infectious amongst our guests...ask them about some of their recent North American travels, they have stories to tell! Having worked for many years in the winter tourism industry, including in France & Finnish Lapland, this duo know hard work and possess the drive to achieve excellence in their endeavours. Fluent in both French & English with basic Spanish, Fabien & Valérie enjoy welcoming guests from all corners of the globe. ​If you're Journeyman Lodge bound, chances are Nick will be the first person you meet. As a crew member at Callaghan Country, Nick keeps the details in order for upcoming and past lodge visits; he makes reservations, processes payments, answers phones, emails, and finally, welcomes our guests at check-in. Nick joined the Callaghan Country team in Spring of 2017. He's a seasoned guest service professional with a background in history and a classic west coast appetite for snow sports (snowboarding particularly) so rather naturally, he found his way to Callaghan Country! Nick is the hub of daily communications among our team members so he's a pretty busy guy in the office most of the time but feel free to ask him about the ski into the lodge and he'll load you up on all the details with a smile.